A conference in celebration of the 50th Anniversary of the Journal of Arabic Literature. Full program details to follow. 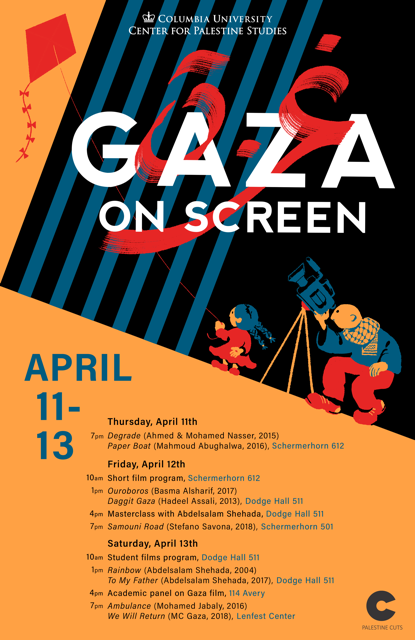 Organized by Muhsin al-Musawi (Columbia), Elizabeth Holt (Bard), Tarek El-Ariss (Dartmouth College), Nizar F. Hermes (University of Virginia) and Anna Ziajka-Stanton (Penn State University). Sponsored by the Middle East Institute; the Department of Middle Eastern; South Asian, and African Studies; Society of Fellows, Heyman Center; the Department of East Asian Languages and Cultures; Weatherhead East Asian Institute and Center for Chinese Literature and Culture; University Seminars; Division of Humanities in the Arts and Sciences; Dartmouth College; Brill Academic Publishers; Dr. Aziz Shaibani/Arab-American Educational Foundation, Executive Vice President and Dean of the Faculty of Arts and Sciences at Columbia University. Columbia University Middle East Institute will be hosting a professional development workshop for teachers, grades 8-12. 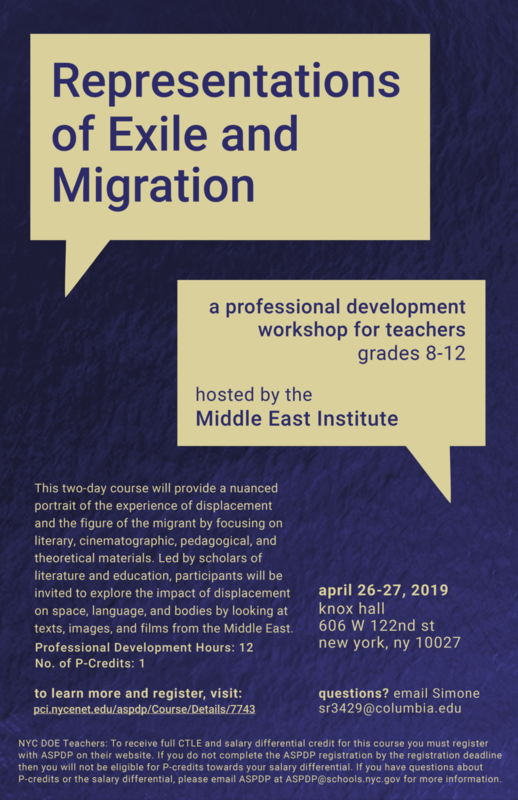 This two-day course will provide a nuanced portrait of the experience of displacement and the figure of the migrant by focusing on literary, cinematographic, pedagogical, and theoretical materials. Please email Simone with any questions at sr3429@columbia.edu. The Center for the Study of Muslim Societies and Institute for Social and Economic Research and Policy present Dark Water, Burning World: The Island of Lesbos and the Boats of Syria. With Poetry by Ruth Padel and Artwork by Issam Kourbaj. For more information, please visit the Committee on Global Thought website. “Over the course of the Gulf Wars, vast caches of records were looted from the institutions of the Iraqi state and the Ba’th Party. The archives were shipped to the United States, in part due to the perceived value as evidence of state violence. Presented by Rebecca Abby Whiting, visiting PhD Candidate, Department of History at the University of Glasgow. Sponsored by the Center for the Study of Muslim Societies and the Institute for Social and Economic Research and Policy. This lecture is organized as part of the course, ‘Mapping Maritime Frontiers in the Eastern Mediterranean’, at Columbia University taught by Nora Akawi and Naor Ben Yahoyada. The event is co-sponsored by the Department of Anthropology, Studio-X Amman at the Graduate School of Architecture, Planning and Preservation and the Columbia Global Centers | Amman, the Institute for Social and Economic Research and Policy, the European Institute, and the Middle East Institute at Columbia University. ”The ‘permanent crisis’ narrative employed by destination countries in Europe, North America, and Australia, has allowed them to structuralise ‘exceptional’ measures as part of their domestic apparatuses of border control in their war against irregular migration. This is particularly visible at sea, where ‘pull-backs’ by proxy, ‘privatized’ interdiction by merchant vessels, and instances of non-rescue challenge the core principles of international protection. Many have written on the erosion of non-refoulement in extraterritorial contexts, denouncing the difficulties facing ‘boat migrants’ in reaching safe haven. The extra-territoriality of the oceans, removed from the public eye, creates an ‘out of sight, out of mind’ effect favouring the excesses of power characteristic of Operation Sovereign Borders in Australia, the mare clausum approach followed by the EU, and the ‘wet foot / dry foot’ arbitrariness still guiding the US Caribbean interdiction programme. These initiatives have a well-documented negative impact on the rights of ‘boat migrants’ and fail to address the root causes of displacement. Instead, as several studies corroborate, they divert flows towards ever more perilous routes and contribute to the raise of death tolls. They entrench insecurity, fuelling not only the original causes of flight but creating new dangers impeding access to protection – if not denying plain survival. The question hence arises as for whether ‘policies based on deterrence, militarization and extraterritoriality’, denounced by UN Special Rapporteur Agnès Callamard and others, ‘which implicitly or explicitly tolerate [and perpetuate] the risk of migrant deaths as part of an effective control of entry’ are compatible with international law. * What is more, the point is to elucidate whether trapping migrants in a vicious circle of more control, more danger, and more displacement, where they can only rely on facilitators to escape life-threatening perils, does not per se amount to a form of ‘persecution’ in the sense of Article 1(A)2 of the 1951 Refugee Convention. This is the question this paper proposes to explore to determine the limits that international (refugee) law should be understood to impose on consolidating practices of ‘remote’ (yet violent) maritime border control that deter entry by endangering human life, whether purposely or inadvertently. The role of knowledge (rather than intent), the foreseeability of lethal consequences of policy measures, and due diligence obligations to protect physical integrity from irreversible harm will be examined in this framework. The final goal is to (re-)define the contours of what constitutes a legitimate exercise of sovereignty when managing maritime migration flows. *Report of the Special Rapporteur of the Human Rights Council on Extrajudicial, Summary or Arbitrary Executions, Agnès Callamard, A/72/335 (2018), para 10 (emphasis added). 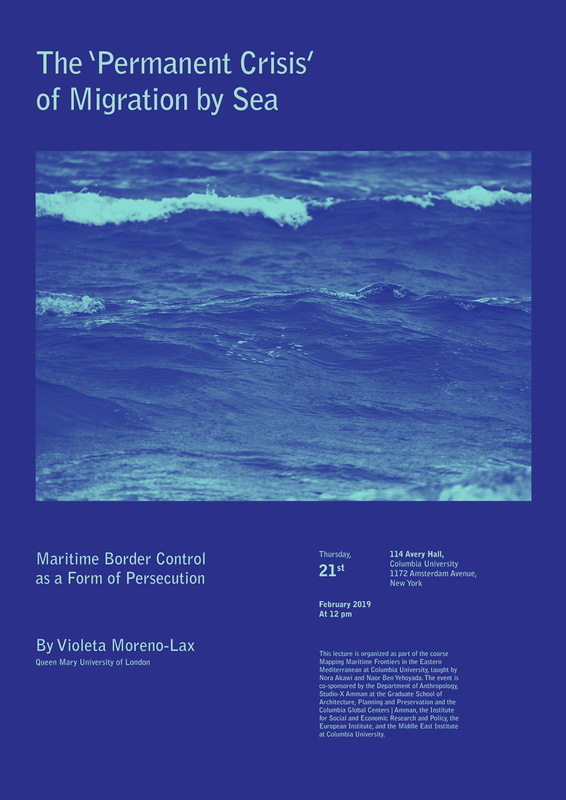 This lecture is organized as part of the course Mapping Maritime Frontiers in the Eastern Mediterranean at Columbia University, taught by Nora Akawi and Naor Ben-Yehoyada. The event is co-sponsored by the Department of Anthropology, Studio-X Amman at the Graduate School of Architecture, Planning and Preservation and Columbia Global Centers | Amman, the Institute for Social and Economic Research and Policy, the European Institute, and the Middle East Institute at Columbia University. A panel discussion celebrating the recent work by Hamid Dabashi. Sponsored by the Society of Fellows and Heyman Center for the Humanities, Office of the Divisional Deans in the Faculty of Arts and Sciences, Middle East Institute, The Department of Middle Eastern, South Asian and African Studies, as well as the Institute for Comparative Literature and Society. 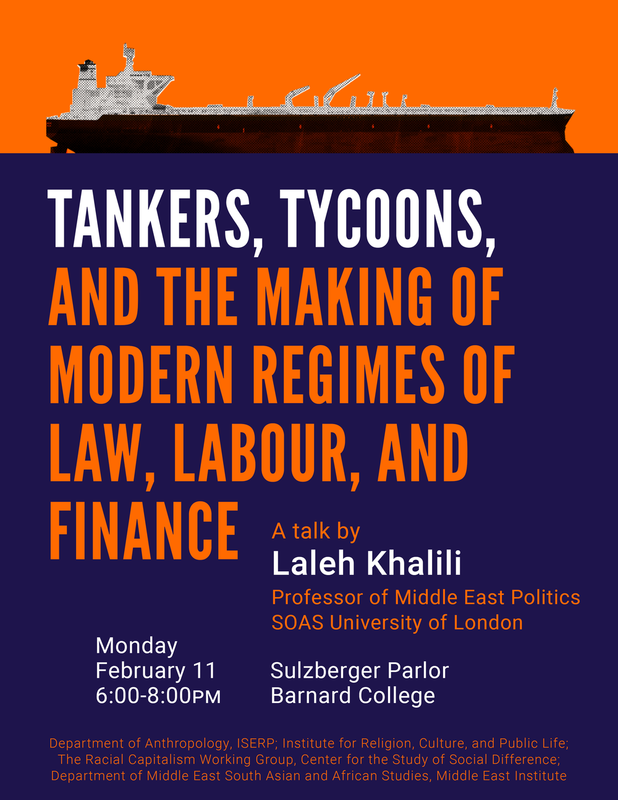 An evening talk with Lelah Khalili, Professor of Middle East Politics SOAS University of London, on the evolution of modern regimes. Sponsored by the Department of Anthropology, Institute of Religion, Culture, and Public Life, The Racial Capitalism Working Group, Department of Middle East, South Asian, and African Studies, and the Middle East Institute. 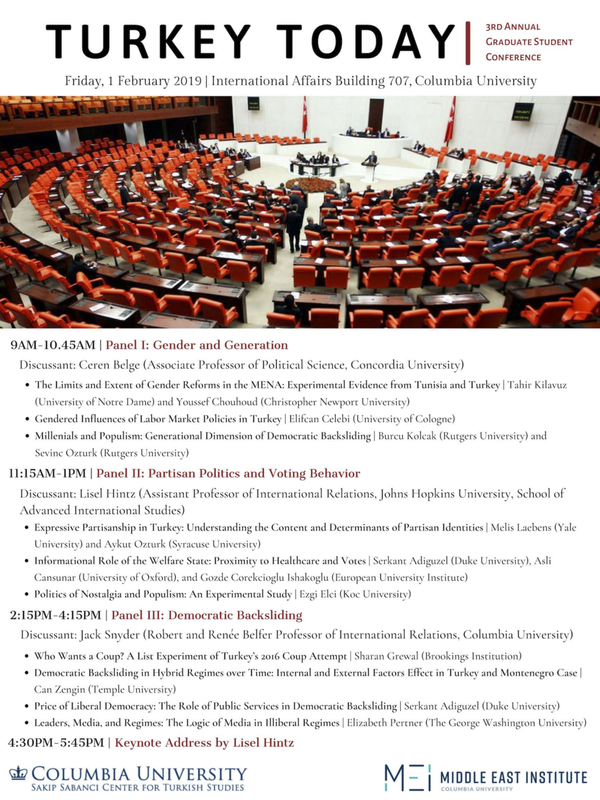 Sponsored by The Sakıp Sabancı Center for Turkish Studies and The Middle East Institute at Columbia University. Jasbir Puar, Rutgers University professor, examines the production of mobility obstacles and restrictions in Palestine through the linked frames of disaster and carceral capitalism, highlighting the logistics of border crossings and movement in the West Bank in relation to disability rights frameworks. Co-sponsored by the Middle East Institute and the Institute for Research on Women, Gender, and Sexuality. TALK | Is Occult Science Science? A lecture by Shi’i Studies Research Program visitor, Matthew Melvin-Koushki, with commentary by Assistant Professor A. Tunc Sen on the historical study of Islamicate occult science. Sponsored by the Middle East Institute and the Center for the Study of Muslim Societies. In this groundbreaking book, leading Arab and Jewish intellectuals examine how and why the Holocaust and the Nakba are interlinked without blurring fundamental differences between them. While these two foundational tragedies are often discussed separately and in abstraction from the constitutive historical global contexts of nationalism and colonialism, The Holocaust and the Nakba explores the historical, political, and cultural intersections between them. The majority of the contributors argue that these intersections are embedded in cultural imaginations, colonial and asymmetrical power relations, realities, and structures. Focusing on them paves the way for a new political, historical, and moral grammar that enables a joint Arab-Jewish dwelling and supports historical reconciliation in Israel/Palestine. This event is cosponsored by the Department of Religion, the Middle East Institute, and the Institute for Israel and Jewish Studies. Join the Columbia SIPA Middle East and North Africa (MENA) Forum for a Voices and Views Speaking Event: Ta'al Bachir (Come Tomorrow): The Politics of Waiting for Citizenship, TUESDAY DECEMBER 4th, 6:10-7:30pm in Room IAB 1512 with guest speaker Dr. Noora Lori, Assistant Professor of International Relations at Boston University and author of the forthcoming book, Offshore Citizens: Permanent 'Temporary' Status in the Gulf. Light snacks provided. Moderated by Professor Lisa Anderson. POST EVENT OPPORTUNITY: Five Columbia University students are invited to attend a post-event intimate dinner conversation with the speaker immediately following the event. The first five students to contact Sarah Stone, MENA Communications Chair (sbs2181@columbia.edu) will receive a spot. Please include "12/4 MENA Dinner" as the subject. Professor Sadeghi argues that al-Ghazali’s Deliverance from Error represents the kind of shift Bartley described, from pan-rationalism to critical rationalism. As a scholar of Ash’ari kalam, al-Ghazali had been an exponent of the pan-rationalist meta-context governing kalam, falsafa, and Batini thought, which insisted that every proposition be justified by a sequence of logical inferences ultimately rooted in firm foundations. He experienced a crisis when he realized that his cherished beliefs could not be justified in this way. True to the pan-rationalist demand to believe only what is rationally justified, he privately gave up all belief. After two miserable months as a skeptic, an epiphany allowed him to have beliefs: namely, he gave up the requirement that all beliefs be justified by reason. Crucially, though, he did not thereby reject reason; rather, he became a critical rationalist. His faith in Islam was restored, and he set out to determine which approach to Islam is correct — kalam, falsafa, Isma’ilism, or Sufism. He argued for Sufism using a mixture of rational argumentation and rationally unjustified beliefs. SHARIA WORKSHOP | Leor Halevi presents his paper "Spirits of Islamic Law in the British Empire: Impurity, Modernity, and Alcohol in interwar Bombay and Cairo"
Shari’a Workshop is invitation only. To register for this event, please contact Astrid Benedek at amb49@columbia.edu. Reinforce your language skills in a conversational setting. Visit our website for details. Arabic language circle held on Wednesdays from 6 - 7:30 PM in Knox Hall, Room 403. Join student organizations at the School of International and Public Affairs on Tuesday, November 27 from 6:10 - 8:00 PM in IAB 1512 for a conversation with three distinguished panelists on the intersection of gender and security policy issues. Presented by the Institute of African Studies, with guest, Rawia Tawfik from Cairo University and moderated by Abosede George from Columbia University. After decades of the marginalization of Africa in its foreign policy priorities, Egypt seems to be making a strong comeback to the continent. Active presidential diplomacy under President Sisi has been combined with the restructuring of a number of institutions responsible for implementing Egypt’s Africa policy. This lecture explores whether this rising interest in Africa has been translated into a clear definition of a new Egyptian role in the continent.